11C-(R)-PK11195 positron emission tomography (PET) was used to explore and delineate in vivo the cortical lesion in three clinically isolated upper motor neurone syndromes of similar presentation, with reference to the syndrome of progressive spastic hemiparesis first described by Mills. Three patients with isolated UMN syndromes underwent 11C-(R)-PK11195 PET of the brain. One patient fulfilled criteria for PLS. Two others had clinical features similar to the cases described by Mills; one of these had a high cervical cord inflammatory lesion previously noted on magnetic resonance imaging. The patient with PLS showed focal increase in the binding of 11C-(R)-PK11195, indicating microglial activation, in the motor cortex contralateral to the predominantly affected limbs. Of the other two patients, one demonstrated marked increases in binding in the superior frontal region (supplementary motor region) contralateral to the affected limbs. In contrast, no focal areas of increased binding were seen in the cerebral cortex of the third patient, who had a high cervical cord lesion and was presumed to have extra-cerebral inflammatory disease. 11C-(R)-PK11195 PET demonstrates in vivo that active pathology may be detectable many years after the onset of symptoms, and that it can occur in disparate sites with clinically similar presentations. We conclude that Mills’ syndrome is a purely clinical description that should be reserved for patients with a progressive spastic hemiparesis for which no other explanation can be found. The isoquinoline PK11195 is a selective ligand for the peripheral benzodiazepine receptor expressed by activated microglia. 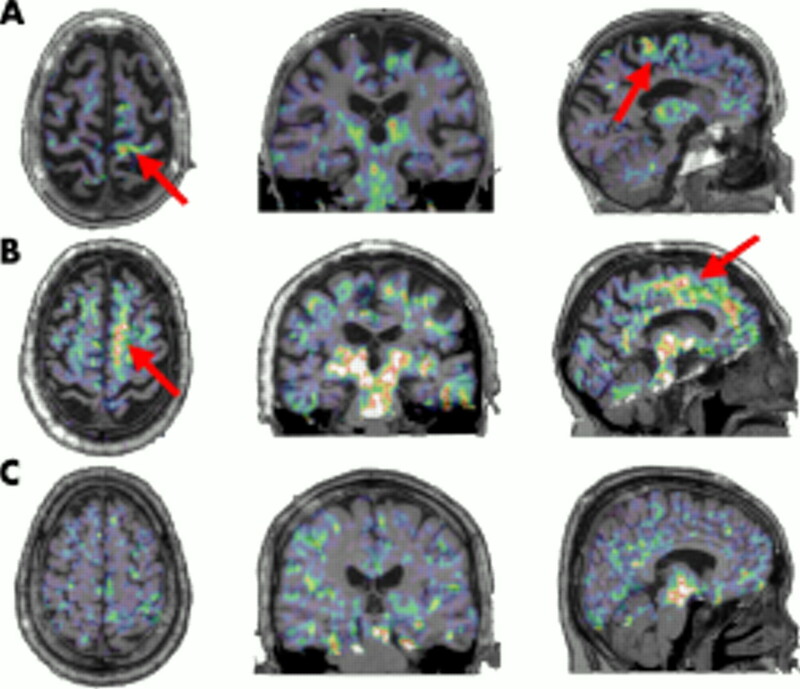 11C-(R)-PK11195 positron emission tomography (PET) is established as an in vivo marker of cerebral microglial activation.5 Such activation may contribute to the neuronal damage in ALS 6, and there is evidence of cerebral microglial activation in motor pathways and other cortical regions.711C-(R)-PK11195 PET was used to study patients with pure UMN syndromes, one fulfilling criteria for PLS, and two with clinical features similar to those described by Mills. Three patients underwent 11C-(R)-PK11195 PET. One had PLS according to diagnostic criteria,1 and two others presented with unilateral UMN signs, one of whom was known to have a high cervical cord inflammatory lesion but normal cerebral magnetic resonance imaging (MRI). Table 1 summarises the patient characteristics. All gave informed consent and the study was approved by the Administration of Radioactive Substances Advisory Committee (ARSAC) and the ethics committees of the Institute of Psychiatry and the Hammersmith and King’s College Hospitals NHS Trusts. PET was performed with an ECAT 953B PET scanner (CTI/Siemens, Knoxville, TN, USA) operated in three dimensional acquisition mode. At the onset of scanning, 10 mCi of 11C-(R)-PK11195 were injected intravenously over 30 seconds. Dynamic data were collected over 60 minutes as 18 timeframes. A measured attenuation correction was computed with a 15 minute transmission scan obtained in two dimensional mode using an external rotating point source of 68Ge acquired before the emission time frames. Scatter was measured and corrected by use of a dual low energy window method. Data were reconstructed using a ramp filter at Nyquist cut off. Parametric images of 11C-(R)-PK11195 binding potential (BP) were generated with a basis function implementation of a simplified reference tissue model (see Turner et al7 and Banati5). Cluster analysis was used to define a population of voxels in each subject with ligand uptake kinetics similar to those derived from a healthy control population, in order to provide the reference input function (see Banati5). Three dimensional T1 weighted MRIs (1.0 Tesla; Picker HPQ, OH, USA) were obtained and co-registered with the PET volume, using a colour scale to represent the magnitude of the BP (Analyze version 6.0; Biomedical Imaging Resource, Mayo Clinic, Rochester, MN, USA). Constitutive binding of 11C-(R)-PK11195 within the skull bones and air sinuses (seen in previous studies7,8) was removed for clarity via manual editing of the final images. A quantitative region of interest analysis was not performed as we had no a priori assumptions; the aim was to detect major “qualitative” differences between clinically similar phenotypes. Results are shown in fig 1. Transverse, coronal, and sagittal co-registered T1 MRI and 11C-(R)-PK11195 PET images for the three cases. The predominant increased signal is within the contralateral motor cortex in patient 1 (A) and the superior frontal region in patient 2 (B) (indicated with arrows). There is no clear area of increased cortical signal in patient 3 (C). Patient 1 demonstrated increased 11C-(R)-PK11195 BP in the region of the motor cortex (pre-central gyrus), more marked on the left side (contralateral to the predominantly weak side). There was also increased binding in the region of the thalamus and pons bilaterally, and marked, generalised cortical atrophy. Patient 2 showed a marked area of increased 11C-(R)-PK11195 BP anterior to the pre-central gyrus, in the region of superior frontal lobe and over the medial internal surface of the left hemisphere (supplementary motor area), contralateral to the limbs with the presenting symptoms. The thalamic and pontine signals were similar on both sides, and there was significant generalised cortical atrophy. Patient 3 showed no focal areas of high 11C-(R)-PK11195 BP within the cortex, and only a small patch of signal in the upper pontine region. The cervical cord was not in the field of view. The absence of a significant focal increase in cortical 11C-(R)-PK11195 BP in patient 3, combined with knowledge of a unilateral high cervical spinal cord lesion, strengthens the case that this probably represents an isolated demyelinating syndrome. In a series of patients with clinically definite multiple sclerosis, 11C-(R)-PK11195 PET revealed extensive cerebral microglial activation.10 There was no evidence of central white matter microglial activation in this study, although the left visual EP was delayed. Patients 1 and 2 had evidence of a primary cortical lesion, accounting for their signs. This lesion was contralateral to the clinically most affected side in both cases, but in different regions. Microglial activation is found both in the area of primary neuronal damage and in connected brain regions. There is evidence that peripheral lesions can lead to retrograde activation.11 In all three cases, increased uptake was seen in thalamus and pons. In our previous 11C-(R)-PK11195 PET study of ALS patients, the thalamic BP was significantly increased compared with controls.7 As this structure has high cortical connectivity (including connectivity with the motor cortex12), this finding might well be attributed to retrograde microglial activation, or support a “dying back” axonal degenerative process from below. However, constitutive binding of 11C-(R)-PK11195 within the thalamus and pons in healthy patients has been described in previous studies, and increases with age,7,8 so that the interpretation of the increased BP in these structures in this small group study remains cautious. Patient 1: a true case of PLS? A transcranial magnetic stimulation study supported the notion that the cortical lesion in PLS is different to that in ALS.21 Increased cortical atrophy has been noted in PLS compared to ALS cases,22 and it is widespread, progressing over time.23 Both patients 1 and 2 demonstrated significant generalised cortical atrophy in the absence of cognitive impairment, but as they were also relatively elderly, this is of uncertain significance. The balance of presentation and results from this study supports a diagnosis of PLS in patient 1, but the development of mild extrapyramidal features remains unexplained. Patient 2 provides evidence for a distinct cortical process, implicating supplementary motor regions. The area of increased signal encompasses the cortical territory supplied by the anterior cerebral artery, raising the possibility of a vascular aetiology. Two foci of altered signal on MRI had been noted in the past, possibly representing lacunar infarcts, but only one was in the frontal lobe. The extent of increase in PET signal, and the gradual and progressive nature of the symptoms, makes a single vascular event an unlikely explanation. The possibility of the identified abnormalities being a chronic response to head injury cannot be entirely excluded. Disparate sites of pathology can be associated with isolated progressive unilateral UMN syndromes, and “Mills’ syndrome” is thus only a descriptive clinical term. 11C-(R)-PK11195 PET has the potential to delineate similar clinical phenotypes in vivo, and activated microglia may be detectable many years after the onset of symptoms. M R Turner is supported by a Wellcome Trust Clinical Research Fellowship. The King’s MND Care & Research Centre (M R Turner, A Al-Chalabi, C E Shaw, P N Leig) receives support from the Motor Neurone Disease Association (UK). A Al-Chalabi is an MRC Clinician Scientist. D J Brooks receives support from the MRC. We are indebted to the patients for their participation in this project. Thanks also to the radiographer A Blyth and PET technician L Scnorr. Pringle CE, Hudson AJ, Munoz DG, et al. Primary lateral sclerosis. Clinical features, neuropathology and diagnostic criteria. Brain 1992;115:495–520. Hudson AJ, Kiernan JA, Munoz DG, et al. Clinicopathological features of primary lateral sclerosis are different from amyotrophic lateral sclerosis. Brain Res Bull 1993;30:359–64. Le Forestier N, Maisonobe T, Piquard A, et al. Does primary lateral sclerosis exist? A study of 20 patients and a review of the literature. Brain 2001;124:1989–99. Mills CK. A case of unilateral progressive ascending paralysis, probably representing a new form of degenerative disease. J Nerv Ment Dis1900;27:195–200. Banati RB. Visualising microglial activation in vivo. Glia2002;40:206–17. McGeer PL, McGeer EG. Inflammatory processes in amyotrophic lateral sclerosis. Muscle Nerve2002;26:459–70. Turner MR, Cagnin A, Turkheimer FE, et al. Evidence of widespread cerebral microglial activation in amyotrophic lateral sclerosis: an [(11)C](R)-PK11195 positron emission tomography study. Neurobiol Dis 2004;15:601–9. Cagnin A, Brooks DJ, Kennedy AM, et al. In-vivo measurement of activated microglia in dementia. Lancet 2001;358:461–7. Brooks BR, Miller RG, Swash M, et al. El Escorial revisited: revised criteria for the diagnosis of amyotrophic lateral sclerosis. Amyotroph Lateral Scler Other Motor Neuron Disord 2000;1:293–9. Banati RB, Newcombe J, Gunn RN, et al. The peripheral benzodiazepine binding site in the brain in multiple sclerosis: Quantitative in vivo imaging of microglia as a measure of disease activity. Brain 2000;123:2321–37. Banati RB, Cagnin A, Brooks DJ, et al. Long-term trans-synaptic glial responses in the human thalamus after peripheral nerve injury. Neuroreport 2001;12:3439–42. Behrens TE, Johansen-Berg H, Woolrich MW, et al. Non-invasive mapping of connections between human thalamus and cortex using diffusion imaging. Nat Neurosci 2003;6:750–7. Riley DE, Lang AE. Clinical diagnostic criteria. Corticobasal degeneration. Philadelphia: Lippincott, Williams and Wilkins, 2000:29–34. Ukmar M, Moretti R, Torre P, et al. Corticobasal degeneration: structural and functional MRI and single-photon emission computed tomography. Neuroradiology 2003;45:708–12. Gerhard A, Watts J, Trender-Gerhard I, et al. In vivo imaging of microglial activation with [11C](R)-PK11195 in corticobasal degeneration. Mov Disord 2004;19:1221–6. Desai J, Swash M. Extrapyramidal involvement in amyotrophic lateral sclerosis: backward falls and retropulsion. J Neurol Neurosurg Psychiatry1999;67:214–16. Mochizuki A, Komatsuzaki Y, Iwamoto H, et al. Frontotemporal dementia with ubiquitinated neuronal inclusions presenting with primary lateral sclerosis and parkinsonism: clinicopathological report of an autopsy case. Acta Neuropathol (Berl) 2004;107:377–80. Zhai P, Pagan F, Statland J, et al. Primary lateral sclerosis: A heterogeneous disorder composed of different subtypes? Neurology 2003;60:1258–65. Ellis CM, Simmons A, Jones DK, et al. Diffusion tensor MRI assesses corticospinal tract damage in ALS. Neurology 1999;53:1051–8. Ulug AM, Grunewald T, Lin MT, et al. Diffusion tensor imaging in the diagnosis of primary lateral sclerosis. J Magn Reson Imaging 2004;19:34–9. Weber M, Stewart H, Hirota N, et al. Corticomotoneuronal connections in primary lateral sclerosis (PLS). Amyotroph Lateral Scler Other Motor Neuron Disord 2002;3:190–8. Kuipers-Upmeijer J, de Jager AE, Hew JM, et al. Primary lateral sclerosis: clinical, neurophysiological, and magnetic resonance findings. J Neurol Neurosurg Psychiatry 2001;71:615–20. Smith CD. Serial MRI findings in a case of primary lateral sclerosis. Neurology2002;58:647–9. Gastaut JL, Bartolomei F. Mills’ syndrome: ascending (or descending) progressive hemiplegia: a hemiplegic form of primary lateral sclerosis? J Neurol Neurosurg Psychiatry 1994;57:1280–1. Mills CK, Spiller WG. A case of progressively developing hemiplegia later becoming triplegia resulting from primary degeneration of the pyramidal tracts. J Nerv Ment Dis1903;30:385–97.